You'll love this. The Fox channel in Washington D.C. became aware that photographers were being hassled by security in Union Station (the train station in Washington), so they dispatched a reporter and a crew to do a story on it. So they're interviewing the head spokesman for Amtrak, who is explaining that there aren't any laws or rules against photography inside the train station...when a security guard comes up and tells the TV crew they'll have to turn the cameras off. 'We have a policy but I cannot tell you'? Let's forget a moment about the way superior guy giving an interview [and hopefully, though not clear from the FOX material, challenging the security guard] and concentrate on the way security is handled: on a 'believe me or else' basis. Here's my tip - always works: When private security guards, managers or scapegoats are telling you they call the police - let them. Even at the off-chance the policemen and -women do not immediately agree with you, it will only take a handful of highly publicised [court] cases and the whole "policy" of harassment will die. You know, pointing a video camera at someone being really stupid and officious seems to be the best cure. "We have a No Photography Policy"
"I can't answer your questions." Hmmm, makes me wonder if it does indeed exist. My reaction to the threats of police action. "Sure call 'em. I want to be there when you explain which laws I broke. I have receipts for purchases from the mall and I have an Amtrak ticket, so I can't be tresspassing." On a vacation trip to Washington this past April, I made many photographs inside Union Station, and I didn't get a second look from any security people. I even went up on a closed mezzanine section of a restaurant for a few shots, and no one seemed to notice. However, I wasn't using a tripod, which seems to be the "red cape in front of the bull" for security types. From what I've read on some other sites, most notably Scott Kelby's Photoshop Insider blog, tripods somehow are considered a dead giveaway of possible terrorist activity. Go figure. That our right to photograph is NOT in jeopardy. Also proof that most SECURITY PERSONNEL are less than capable to professionally and accurately perform the job given. We are under attack by nitwits not these guys. Actually, there ARE laws in many public places in Washington against the use of tripods. The reason has nothing to do with terrorism or the First Amendment--the laws were passed decades ago when it was found that proliferating tourist tripods were impeding foot traffic on sidewalks and in public spaces. You need in a permit in many areas of official Washington to use a tripod, even outdoors. Permits are available in a small office on the rear (East-facing) side of the Capital building, open only during normal business hours. Once you have a permit the Security people, police, Uniformed Secret Service, etc. will let you proceed. While visiting the pits at the Melbourne F1 Grand Prix on the Wednesday this year (the day before any cars are on the track, and a pretty relaxed day to be in the pits), there was a security guy who off his own bat decided that no-one was allowed to take photos of any of the cars.... if it wasn't so ridiculous seeing him try to stop accredited FIA photographers from doing their job, it would have almost been amusing. Give some people a badge and they think they have power. Security guards are an easy target in these situations BUT have they had relevant policies and rules clearly explained? What specific training and instructions have they been given? I think you'll find in many cases they have been given inadequate or vague instructions. You can't expect a generally poorly paid employee to take responsibility for interpreting and applying the various rules and laws that may pertain to a given situation. That's a manager's job. 9 times out of 10, security would prefer to avoid confrontation - they are only doing what they believe they have been told to do. The guards (those with Amtrak and those with the management company that runs the mall portion) at Union Station have ALL recently been retrained regarding the photo policy. There's no excuse for them not to know it. Beside having the potential to impede normal pedestrian traffic flow, tripods are commonly used by people doing purely commercial photography. Many municipalities require permits (and permit fees) for commercial photography, so tripod use will usually lead to an officer asking something like "Who do you work for? What are you doing". Well this flap will certainly eventually set D.C.'s Union Station policies and practices straight. "Go take some photos and if someone asks what your doing, kill em with kindness and just explain. I'd be willing to bet that the odds of you getting in any sort of trouble is minimal at best." That's basically been my game plan for quite some time and it's worked very well. I've found that what gets me into trouble with the security types is not so much the fact that I'm taking pictures, but that I have a camera with interchangeable lenses and therefore appear to be a professional photographer. Their concern is that I will either be a nuisance or that I will profit from selling the resulting photos without the property owner's permission. I know this because a few of the better informed security personnel I've encountered have told me so. If I'm on private property then they do, in fact, have the right to limit photography. The problem is that in public places such as Union Station, it's not clear which spaces are public and which are private; which rights are unconditional and which aren't. Small wonder that enforcement is so often inconsistent and arbitrary. I have received some of the same reactions photographing in train stations in Chicago. The CTA is notorious for its No Photography policies. I now wonder if these policies actually exist, and if they do, can they be legal? The "L" in Chicago is just as much of Public space as Union Station in DC is (Though it is state property not federal...regardless). This definitely needs to be looked into further. Do these fools realize how small camera are nowadays? Anyone who really wants to take a picture of anything out in public can do without getting caught. Mark S. - the CTA Photography Policy is easily found and permits "snapshots" and prohibits "equipment such as lighting, tripods, cables" and "obstructing transit operations". What about monopods? Are they explicitly included (or excluded) by the DC policy, by any chance? I think one thing that everybody should keep in mind in these situations is that many of these security guards are simply following vague orders. The guard posted outside the door of a building isn’t exactly involved in the highest level of policymaking and more than likely does their best not to try to put their own spin on what the folks that sign their check is saying to do. It is annoying, and I get more than my fair share of it as a working photojournalist in Washington, D.C.
I’ve been through more background checks that any normal person should have to bear and have enough passes around my neck to get into almost any building in the City. But lets say I go try to take a stock picture of the IMF building the response from security tends to be quick and epic as if they confused my camera for a detonator button. One of the best words of advice I was given when I started out is that the worst thing you can do is inform a cop/security guard of your rights when they are telling you not to do something. They want to be in charge and they want you to obey. Remember then can arrest you for anything. You won’t get locked up or charged but there’s nothing stopping them from slapping cuffs on you. So instead of whipping out a card that details your rights just stay calm and ask to speak to a supervisor. If they don’t want to let you or refuse then I suggest just moving on and trying another day. Chances are that picture isn’t going to be your masterpiece. Though I still think it’s completely silly that I can be within a few feet of the President and get hassled for taking pictures of a giant building. Thanks Rep. Norton, but it's not the regular constituents who need to hear this, it's the fools running the security and whoever is responsible for hiring them, and whoever told them that it was their job to harass photographers and lie about policies. Well, I think some of the posters here have it right. With very few exceptions, this behavior isn't about averting terrorism anymore. It isn't even about public safety. Those are just convenient excuses. By now everyone with half a brain knows that terrorists don't go around openly photographing their potential targets. Just as in politics, if you follow the money you might learn what is really happening. In my "insider" experience, this mostly has to do with paying money out, not in anyone receiving income for the photos. As in being sued by people who were unwillingly (and possibly embarassingly) photographed, or being held liable for simply allowing photography in the very unlikely event that some unrelated terrorist action does occur in the future. Never underestimate the chilling power of the lawsuit in today's America. My feeling is that people get hassled by security guards because security guards are generally somewhat aggressive individuals, who are trained to be proactive in their approach to possible trouble-makers, and, they are not usually especially bright. You do run into an occasional college student who is doing security work as a parttime job while going through school, but that's rare. I know this characterization will annoy some people, that security guards are human, too, and that everybody knows an intelligent, hard-working, rights-sensitive security guard. However, the generalization works for me, and generally keeps me out of trouble, even when shooting in shopping malls -- I keep a sharp eye out for security guards. It also helps that I'm an old white guy; racial minorities have more acute problems. I do make a distinction between "photographers" and "people causing a disturbance." Photographers can do that -- a tripod on a busy sidewalk in NYC isn't just a camera support, it's an active hazard, and I don't care if the shooter is a world renowned artist. But, the problem isn't the photography, it's the hazard. In the case above, it's the photography that was objected to, and that ain't right. If the Union Station security guards had said to the TV people, "You are attracting a crowd that is obstructing access to the trains," then they would have had a case, IMHO. I was taking photos in the park in Brooklyn between the Brooklyn Bridge and the Manhattan Bridge a couple months ago with a 1Ds and a monopod intending to stitch together a panorama if I ever got around to it. It's a state park , and they have some sort of rules about "commercial" or "professional" photography. Of course I attracted the attention of some sort of uniformed Park Person , not police or at least not armed. Park Person: You can't use a tripod! Me: this isn't a tripod , see? only one leg. PP: Why are you photographing here? Me: Because thei point is equidistant from both the brooklyn ends of the two bridges and the Manhattan ends of the bridges. PP: Oh... , well what are you going to do with these photographs. Me: What do you mean, do ? PP: After you take them , what are you going to do with them? Me: I'm going to download them to my computer. PP: No, I mean after that. PP: What I meant is, what are you going to use them for? Me: Oh , I'm going to use them to make a panorama by stitching them together. PP: Never mind the details , why are you doing all this? Me: Because I'm a photographer. Me: And I have a masters degree. PP: The issue whether you are going to use these in trade. Once you have a print , what are you going to do with it. Me: Meditate on the success or failure of the physical object as a mnemonic device. So far this one is getting better and better. PP: Do you make money or promote your business by doing that? Me: That would be pretty unlikely, anyway I'm finished here and want to go over there to the city park before I lose the light. 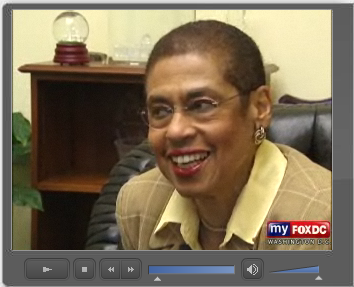 The important thing from what Eleanor Holmes Norton says, is that public space is more than just public property. Once you're invited on to private property you bring, at least some of, your rights as a citizen with you. Clearly this is not cut and dry- think of dress codes in restaurants. However, by my understanding, they would have to prove that you were adversely effecting their business. In DC there's another factor at work. Being considered a potential terrorist target is a sign of status! It means you're IMPORTANT. You're an entity of note. You're worthy. This was explained to me by an insider after I visited there five years ago and was complaining about the unpleasant and aggravating experience associated with truly nonsensical security. I don't care how lowly their position is, or how they're just following orders, or how ill/uninformed their masters leave them. They are given substantial power and authority over me, to direct and restrict my behavior, under threat of detention and police involvement. I bloody well expect them to behave properly and within the strict limits of their true authority. They have neither the moral nor legal authority to go beyond that, and they do have the responsibility that comes with power. They do not get to make up the rules as they go, they do not get to make their erroneous judgement calls, they do not get to "err on the side of caution" and harass without consequences, recriminations and an unpleasant scene. THEY ARE NOT ENTITLED. That's the size of it. "THEY ARE NOT ENTITLED. That's the size of it." Uh... you obviously feel quite strongly about this. But even if "overreaching and overbearing security guards" are not entitled--a sentiment I wholeheartedly agree with, by the way--does this automatically mean that ALL photographers ARE entitled to photograph ANYWHERE, ANY TIME? Does simply pointing this out make someone an "apologist?" FWIW, I'm responding based simply on the merits of your argument, not because I'm worried that it might have been directed at me. Even if it was, no big deal, I've been called a lot worse. I'm also curious to know just how big of a scene you'd be willing to make in defense of your right to photograph. That's ultimately what it all boils down to, right? 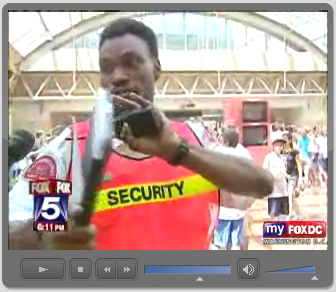 If a security guard at Union Station would insist on tossing out a TV news crew while an Amtrak representative was standing right next to them, he certainly wouldn't back down based on anything you or any other civilian had to say. In this case, it looks as if it will literally take an Act of Congress to change their behavior. I presume everyone has downloaded, printed and read "The Photographer's Right"? Might be handy to keep in your bag. I was in my city's station in England, the Manchester Victoria, when I was stopped, not by a security guard but by a cleaner! I've shot in there since and will again. It's stood since 1844. I was out on the town with my partner when we came across the venue where the then Prime Minister Tony Blair and his party were holding a conference. There was a lot of security and as always I had a camera with me so I took a shot of all the security. A police officer stopped me and he asked me what was the reason for my shooting. My partner was with me so I said that I was trying to make her a star. The joke (bad as it was) broke the ice and after a brief and friendly conversation, two slightly inebriated people wobbled on to the next bar. I have said this before, and I'll keep repeating it: people in authority are using The Eleventh as an excuse to harrass civilians. It's that simple. "I bloody well expect them to behave properly and within the strict limits of their true authority." Since the topic of this thread and the previous one has been solely about photographers' LAWFUL AND ESTABLISHED rights being infringed upon (and I have always been clear that I'm talking about just that), I don't think I need to even respond to your remark -- "does this automatically mean that ALL photographers ARE entitled to photograph ANYWHERE, ANY TIME?" -- because it has nothing to do with my position, meritworthy or not. I don't recall anyone on this board ever taking that position. But, if MikeJ or anyone else has ever asserted this, take it up with them directly; otherwise, I'd prefer you didn't fabricate absolutist red herrings. If I have the spare time, I'm willing to make a fabulous fuss. If I have to be somewhere, it's one thing. If I can spare a free day, I'll be happy to force the guard to call the police and their manager, happy to charge them with assault or battery if they physically inhibit me unlawfully absent the presence of police. Press? Sure! I've no fear of confrontation and I can think of worse uses for my time. I sincerely believe that if more people were like me, there'd be a lot less of this. BUT... I've got no quarrel at all with people who don't want to spend their spare time on this windmill or 'come to the attention of people in high places', are we clear? Just want that on the record in case someone else is inclined to go inventing another argument that's never been made. Oh, and for the record, 'apologist' isn't a bad word. If a security guard at Union Station would insist on tossing out a TV news crew while an Amtrak representative was standing right next to them, he certainly wouldn't back down based on anything you or any other civilian had to say. In this case, it looks as if it will literally take an Act of Congress to change their behavior. Lets not forget that the Fox news crew *wanted to make that very point* (and rightly so)! Don't believe for one minute that they'd let themselves be turfed out of there *if there was a legitimate story* to be had! Furthermore, I've never met a journalist (a good one anyway) who's been willing to take a "no, go away" for an answer! As Ctein said, I think it's important to reiterate that we can only object to UNECESSARY and ILLEGAL harassment of photographers, and only when those photographers are acting within their real rights. Obviously, police and security people do have what's called "discretion," meaning they can use their judgment at the scene, just as it's quite possible for photographers to unwittingly violate a rule or a law. It's also perfectly possible that some guy with a camera could be causing some other sort of disturbance or problem. My brother and I were visiting LA a few years ago. Being that we are from NY, we were up early and decided to see the Disney Performing Arts Center. I was concerned about photographing this new landmark of modern architecture and when two security guards came speeding up in the pre-dawn light I was waitng for the usual argument. Instead we were shown various exterior locations to shoot from, lead inside the still closed lobby to shoot before the crowds arrived and generally had a great time. (You cannot shoot inside the theater itself). Good training and a good attitude can go a long way to improving everyones outlook. Maybe Disney should run Homeland Security? Waiting on line at the airport could become a 4 ticket ride. In reply to a couple of comments on my comment - I am neither defending or condemning the behaviour of security guards, obviously this will vary case by case. The point is they are simply agents carrying out management policy (or what they believe it to be). If, in the case in point, that security guard had been recently been re-trained, then either the training was inadequate or the guard is incompetent and should lose his job. Either way, the responsibility lies with management. I think this is all funny. It is a hassel to be told to move or to stop doing something, and you may be right that they are just mis-informed. Possibly, there was some information that there was sometype of activity (terrorist or not) that they were trying to avoid were being extra careful that day. Who knows, but none of you have the ability to be in their position. If they do something right, no one remembers; if they do something wrong no one forgets. It was said at least once above; walk away and try another day. You whine but if something would have happened (however unlikely that would have been) you would have blamed the security guard for not doing what they were told to do. They can't win and you can't stop whining. I don't understand how comments like "security guards are poorly paid and may not be properly trained on the actual policies" would be accepted by anyone. If a minimum-wage earning bank teller let someone empty your bank account because they weren't properly trained on customer identification policies, would you accept that as a valid excuse for having your money stolen?